This vintage dress really evokes spring and summer to me so I was happy to pull it out of my wardrobe last week for a beautiful sunny day. It reminds me of lemons and oranges too, which I absolutely love so I suppose that is why I had to have it when I saw it. 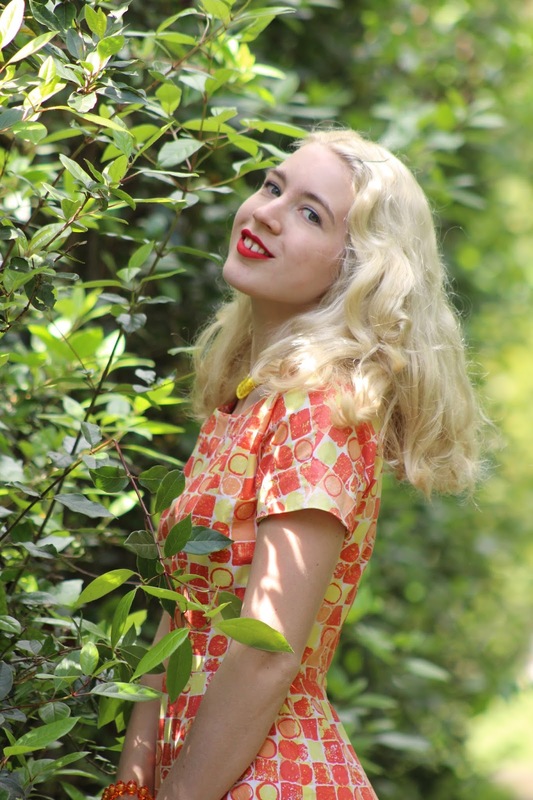 I mainly wear vintage reproduction clothing but I do have a small but lovely little collection of vintage clothing. 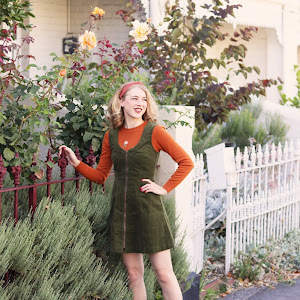 I like to occasionally invest in vintage pieces when I know they will be sturdy and I won't have to worry about wrecking them and this dress felt like it was brand new once I received it. 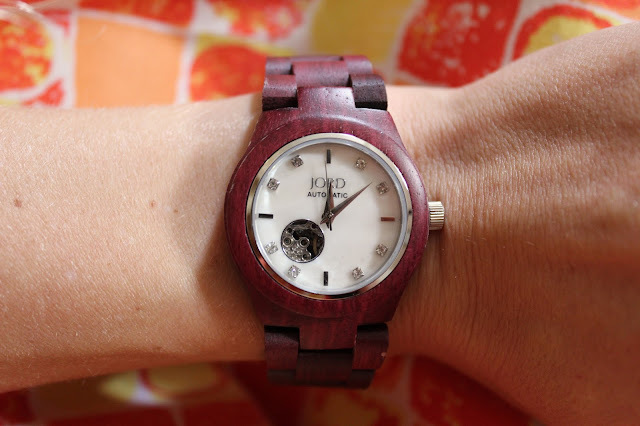 This dress looks lovely mixed with a modern piece and this Cora watch in Purpleheart by JORD Wood Watches seemed like a lovely pairing to me. 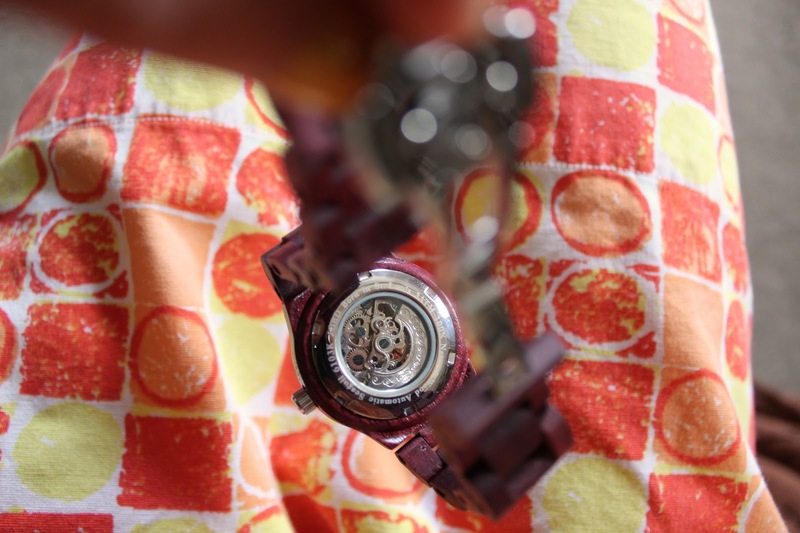 Being a wearer of watches since I was a young girl, I have typically worn either plastic or stainless steel bands. 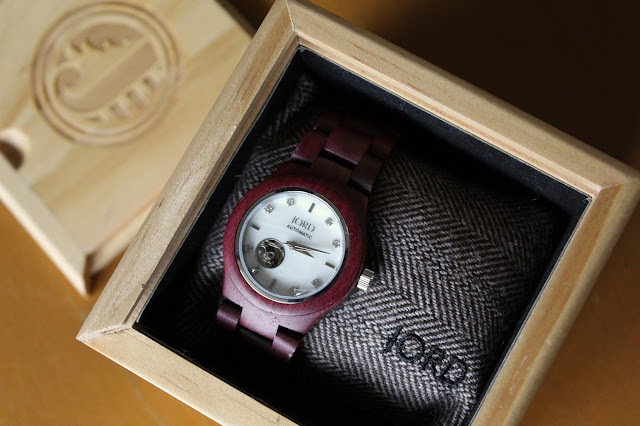 Now I have been upgraded to something very different and it is both a fashionable and unique piece with it's wooden band... 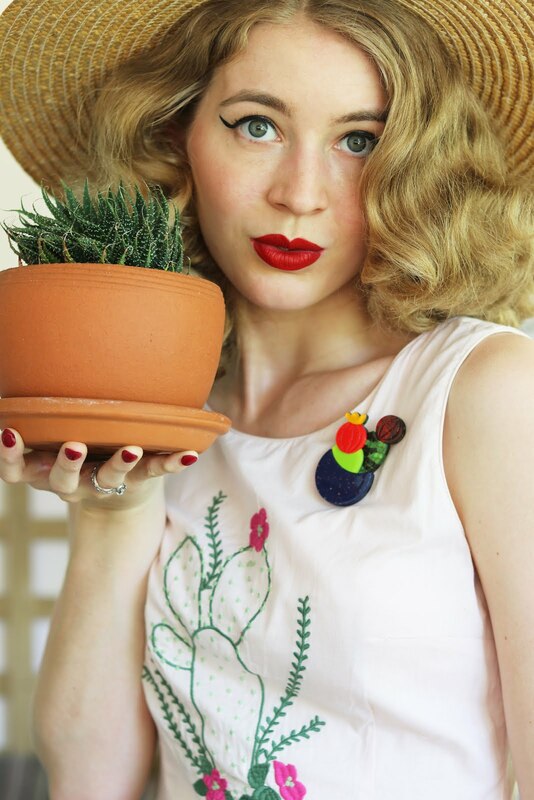 Which is the way I feel about vintage style fashion! This automatic watch is self-winding watch means I won't have to get a battery replaced and I think that's really cool and convenient (as I have often put off replacing my battery with previous watches for a good month or so). The Purpleheart wood is paired with mother of pearl and swarvski crystal markers which makes it really elegant, I also love that you can see the mechanics at the back and peaking through the front. JORD also allows you to have the band adjusted to your wrist size before it is sent off which is really handy. It is also packed in a gorgeous wooden box to keep it safe. I look forward to wearing this for many more years to come! We are experiencing some serious heat here at the moment so I think I will be hitting the beach in the early mornings and afternoons when I can, you can expect my summer outfits to be in full force! No battery?! Ahh! That's crazy! But so cool! I always buy cheap watches because when the batteries die, it's easier to just buy a new one. For some reason, finding the right watch battery here is so challenging!! Haha! 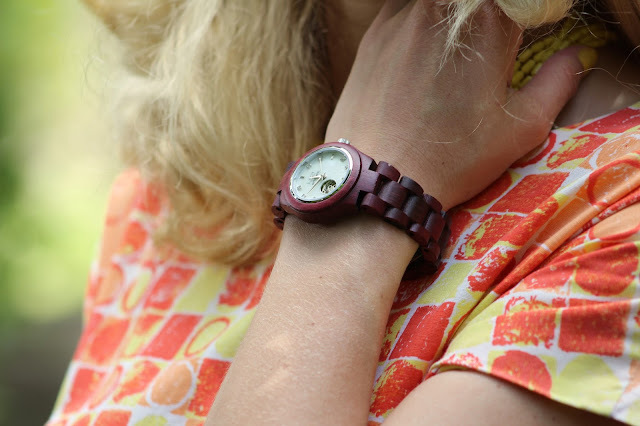 This watch is seriously cute, though, and would go with everything! Gorgeous watch and gorgeous dress!!! Super fun post! That dress is absolutely, positively fantastic! 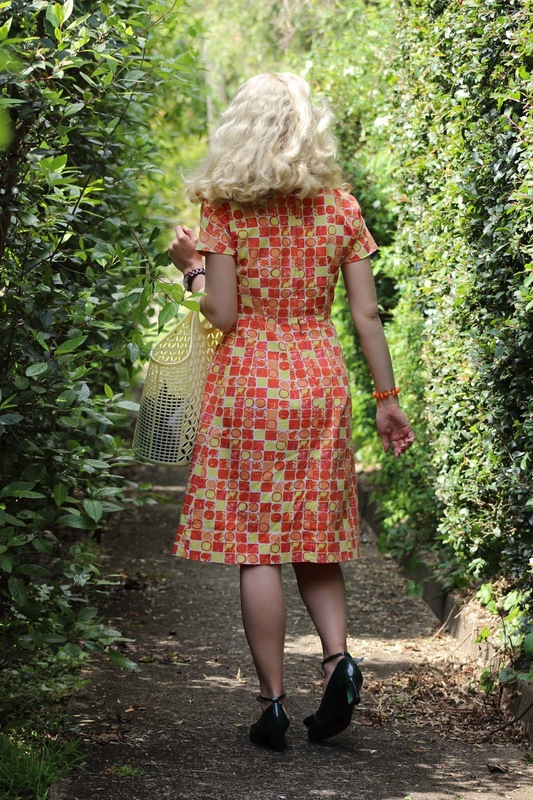 I love the punchy hues, memorable pattern, and classic early 60s style silhouette. So chic!! !